Volunteers from our Medicine & Healthcare in Bolivia project are needed at various 'Centros de Salud', public health clinics open to everyone in Cochabamba, regardless of their ability to pay. With very basic facilities, the health clinics attend to mostly minor emergencies, accidents and routine visits. There is insufficient funding to maintain the facilities in complete working order, or provide the hospital with sufficient staff or materials. Volunteers are therefore needed to help and your work will be greatly appreciated. At the Centros de Salud you have the opportunity to work in a variety of departments; possible options include nursing, paediatrics, gynaecology, admissions and pharmacy work. You can also get involved in community work, including vaccination programmes and dental health campaigns, which the clinics organise throughout the year. 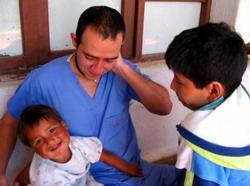 The Burns Unit in the Hospital of Cochabamba treats children from 0 to 15 years-old. Around 200 patients pass through their doors each year. With fifteen beds - three in the intensive care unit - and quite basic medical facilities, you'll find there is a lot you can do to help. Although the doctors have to reuse bandages and the intensive care unit lacks respirators and monitoring equipment, the staff are extremely dedicated and excel at what they do. Currently, our supervisor is the senior resident doctor and other members of staff include a nurse and her assistant, three interns, two physiotherapists and an anaesthetist. Your assistance is needed with basic duties such as making beds, bathing and lifting the children onto beds and into wheelchairs. Equally important are the basic medical tasks such as bandaging, taking blood pressure and dressing wounds. The doctor may also need help in the surgery room, passing equipment and monitoring patients. This placement is ideal for people who are already qualified or currently studying medicine or nursing. The Burns Unit can only take volunteers who are able to commit to working with them for three months or more. The Centros de Salud are happy to have volunteers from a month onwards. Volunteers on the Medicine & Healthcare project will need intermediate Spanish in order to communicate directly with the majority of doctors and patients. We can, however, arrange a translator for volunteers who do not have sufficient Spanish language skills. Many volunteers who lack confidence in their Spanish language ability take a Spanish Language course or join a Teaching or Care project before joining their Medicine & Healthcare programme. This gives you the opportunity to improve your language skills before starting the medical part of your placement. At the Burns Unit there is also a lot of scope for volunteers who are qualified as, or wish to become, Physiotherapists. If you already have a certain level of expertise, we can find a suitably specialised role for you. Working in the Burns unit can be shocking and volunteers need to be well prepared. Situations where patients are badly burned, and treatment is painful and uncomfortable can be very hard to witness, especially when you are new on the placement. However, by helping here you will start to understand the problems faced in Bolivia, and your presence and assistance will make a difference to both the patients and the staff. Volunteers with some physiotherapy experience are also needed to work at a day care centre for disabled children. The centre helps children through a variety of sessions including physiotherapy, hydrotherapy, psychology and speech therapy and volunteers with skills in these other areas would also be very welcome. Volunteers also get involved in identifying and working with children from local orphanages that also need to receive physiotherapy or other treatments. If you are a trained nurse, a Nursing student, or simply on a gap year or career-break or holiday period and interested in gaining some experience in the field you could volunteer with us as a nurse in Bolivia. Our Nursing volunteers work with the Hospital Ibuelo in the town of the same name, about three hours outside of Cochabamba. Many of the patients at this hospital are suffering from tropical diseases, such as Dengue and Yellow Fever, Malaria and Leichmaniasis. Volunteers can also get involved in community-outreach programs. Whether you are planning to study dentistry, a trained professional looking to gain some work experience, or somewhere in-between, Projects Abroad Dentistry placements in Bolivia offer a great opportunity to both help and learn at a project that is literally one of a kind. 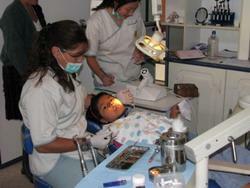 The municipal government in Cochabamba have initiated a unique project to improve dental care for young children across the region. The “Escuelas Saludables” (Healthy Schools) project offers free dental care and education to children aged 5 to 16, and is the only project of this kind in Bolivia, offering rehabilitation, prevention and educational activities. Each Escuela is situated within walking distance of four or five schools and has a catchment area of some 140,000 students. The Escuelas are open all day, from 8:00am-12:00 and 2:00-6:00pm. Volunteers must work either morning or afternoon hours, but depending on your energy, you could also choose to work a full day. Projects Abroad Dentistry volunteers on this project will be assigned to a specific Escuela, working alongside a qualified dentist as a dental assistant. You will have the opportunity to observe and help out with a huge variety of dental procedures, from fillings to root canals and tooth extractions, and even the opportunity to observe complex orthodontic surgeries. Outside of the surgery, Dentistry project volunteers are encouraged to get involved with all aspects of this regional programme; dental campaigns to educate children about how to care for their teeth, donation programmes providing dental equipment to schools, orthodontic campaigns and even monthly meetings to share ideas on how to improve and develop the service. Volunteers on this project will have all their learning organised and supported by our own dental supervisor, who runs regular workshops and training sessions in dental techniques to help develop or introduce new skills. As a training or qualified Occupational Therapy volunteer in Bolivia, you'll be placed in one of a number of institutions for people who are mentally and physically disabled. While residents largely have access to the necessary physiotherapy care, staff are limited in number and don't have enough time to spend one-to-one with these individuals. Physical facilities in these care institutions are also often ill-suited to those with disabilities and are in dire need of a skilled redesign. By coming into the home and using your skills to assess and treat the wide variety of physical and psychiatric conditions you come across, you can help these people to find purposeful activities they can participate in, and help to promote independence in aspects of their life for what may be the first time since they moved there. Depending on your interest, you could also choose to spend some time at a centre for older patients with diseases such as dementia. Here your skills could be put into action training patients in the use of aids to compensate for cognitive decline, or training their care givers in coping-behaviours and supervision. The one-to-one attention you are able to give them, combined with your experience, could make a vital difference to their condition. Intermediate Spanish is recommended for this placement to allow volunteers to communicate with both staff and their patients. 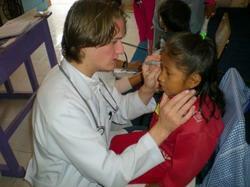 You can do an Elective in Bolivia in Medicine, Physiotherapy or Nursing. If you choose to do your Elective in Bolivia, you will most likely be working in a hospital or health centre in Cochabamba. You will be given a supervisor who will coordinate your placement and act as interpreter in departments where the standard of English is not so high. They will be keen to test out your knowledge, as well as giving you the benefit of their training and experience. Outside of the hospital you will live with a local host family in close proximity to your place of work. Cochabamba is a lively and entertaining city and there are always a number of other Projects Abroad volunteers around for you to explore it with. Вы можете ознакомиться с детальной информацией о целях данного проекта здесь: Bolivia Medicine & Healthcare Management Plan.